Josh Lee - The Chip's Challenge Wiki - The Chip's Challenge Database that anyone can edit! Josh Lee, also known by his alias Flareon350, is a well known Chipster who is notable for his consistent level design. He is also notable for his strong liking of the Pokémon franchise, as his main avatar is his favorite Pokémon, which Josh created himself using CCEdit 2.0. He also has the most amount of levels in Chip's Challenge Level Pack 4, at 37 total - the highest amount by any one designer for any official CC1 set. Josh discovered Chip's Challenge on a Windows 95 computer around mid 2000 at the age of 8. He played the original game, but never did complete every level upon first playing. Levels he skipped included majority of the harder ones; such as Totally Unfair, Blobdance, Doublemaze, and Force Field. He eventually went back to complete these levels in time. After playing the game, Josh created some 700+ levels on pieces of paper, since at the time that computer couldn't be used for internet access. Eventually sometime in the early 2000s, Josh found out about the existence of a [[ChipEdit] via using a different computer and he began to design many different types of levels. Unfortunately, he could not test them because Chip's Challenge couldn't be played on that computer. He heard about CCLP2, however, like with the original game and the lack of being able to download it, he could not play it at the time. He instead watched many of the AVIs available for its levels. This ultimately inspired his first level designs. Josh has been designing levels since as early as 2004. His first goal in level design was to create a set of 210 levels. He made up to 124 levels until the computer being used at the time crashed and eventually the motherboard wiped everything clean, thus deleting the set entirely before ever being publicly released. Because of this incident, Josh refused to redesign every level, since he did not remember any of the ones he made. This ultimately led to a long hiatus. After hearing of CCLP3's submission pool, he once again started the goal in 2009 and released his first levelset; JoshL, which consists of 202 levels, most of which consist of invalid tiles and sequels to numerous CC1 levels. Because of this, none of his levels made it into CCLP3, however, one level (Ruined World) came close to being included in the set, which eventually made its way into CCLP1. In 2012, Josh went back to this set and heavily modified it to be Lynx compatible by removing 82 levels and editing some to remove invalid tiles. It was also renamed to JoshL1, although the set is still tedious and not recommended to play. Looking back at these sets, Josh realizes his errors and mistakes in design and is quite embarrassed by this set's existence. He did not officially join the Chip's Challenge community until sometime in 2012, where he was ultimately noticed. Throughout 2010, he took a break from CC and focused on various other games. After seeing its release and playing CCLP3, Josh returned to the world of CC in 2011 and began to work on another levelset, being entirely Lynx compatible from the start, under the title JoshL2. Consisting of 150 levels, this set showed a lot of improvement since his first set. Although this level set went under various updates with level arranging and replacing, the set was officially done in 2012. This levelset was also let's played by BigOto2 throughout 2011 and 2012, with 55 episodes in total and the last 13 featuring Josh as a co-host via Skype chat. After finishing JoshL2, Josh felt motivated enough to work on another set of levels, which would be called JoshL3. This set's goal was to hold levels of higher difficulty which JoshL2 lacked, however, because of the consistent updates to this set, this goal wasn't possible. Originally JoshL3 was set at 80 levels, however, because of the construction of another level set, it was then merged to a 149 levelset. This became an issue to some community members and to Josh himself, so 49 levels were removed and placed into Josh's reject levelset; JCCLPRejects, thus JoshL3 was official at 100 levels. At the time CCLP1 was announced and level submissions were opened, Josh began work on another set of levels, however, with CCLP1 in mind. JCCLP (Josh's Chip's Challenge Level Pack) which would consist of the best levels of Josh's creation throughout his previous 3 sets. 19 levels were taken from JoshL1, 35 from JoshL2, and 30 from JoshL3. (Note: The version of JoshL3 that was used for JCCLP's construction consisted of 80 levels) Josh also created 65 brand new levels, to keep the set original, which would make JCCLP a 149 level set. While only 125 levels from this set were eligible for consideration, 12 levels from this set got into CCLP1. This set is Josh's most popular level set, with over 800 downloads at CCZone, however, this is because of the constant updates to the set. It was released April 2012 and finalized in May 2013. Following JCCLP's release, Josh decided to release his rejects set, appropriately titled "JCCLPRejects". While unlike many reject sets, this one consists of levels that were actually rejected from JCCLP or any of the JoshL sets. It also holds levels that showcase a potential level concept or an attempt to making a level that the design wasn't good enough to Josh. It also holds some level mods or running joke/inside joke type levels. This set currently holds 218 levels and can be found on pieguy's site. Because of the confusion with JoshL3 and how JCCLP became a huge success in his level designing career, Josh began to work on his "remake" of what JoshL3 was supposed to fulfill, being levels of higher difficulty. This then became JoshL4, which holds 80 levels. 25 of said levels are also from his JCCLP set, due to high demand. Unlike his other sets, JoshL4 is the most difficult of any set of Josh's creations, although it doesn't nearly match up to CCLP3's later levels. This set only went through 32 updates, 3 of which were level replacements. J.B. Lewis let's played this levelset via YouTube, giving review of some levels and criticizing others for how difficult they are. Because of this criticism, Josh felt it was right to work on levelset with the same mindset he had back in JoshL2's creation. Consisting of levels of moderate difficulty and a few hard levels, JoshL5 began development Christmas 2013 and was completed in July 2014. The goal of this set was 100 levels and was reached successfully, however, 10 levels exclusively from JCCLP that weren't placed in JoshL4 were placed here, and 2 levels were not created by Josh at all. Because Josh made the goal of 100 levels successfully, he decided to push his limits even further and added 49 more levels. The set ultimate took roughly a year to create, being released at 149 levels on December 23rd, 2014. It was let's played by J.B. Lewis once again via YouTube throughout the creation process. As soon as JoshL5 was completed at 100 levels, JCCLP2 became official and was released in August 2014, with 149 levels, most of which are from all of the JoshL sets, and some from JCCLPRejects. Only 2 levels were created fresh for this set, however, they later reappeared in JoshL5. Later in May 2016, however, Josh overhauled and rebuilt JCCLP2, scrapping the old version entirely due to the fact the older version was rushed. The new and final version of this set still holds 149 levels but now consists of levels only found in Josh's latter three sets - JoshL4, 5, and 6. 25 levels were from JoshL4, 73 from JoshL5, and 47 from JoshL6 (the pre-149 level release version). Two JCCLPRejects levels were also included in this set due to getting positive criticism by various community members, as well as two new levels specifically designed for this set. After JoshL5's completion, Josh began work on JoshL6, and was initially released with 40 brand new levels of arranged difficulty on May 23rd, 2015 - five days before CC2's release. However, because of a loss of interest in designing levels for CC2 and with CCLP4 being officially announced, he decided to expand JoshL6, bringing the total up to 90. However, due to yet another spike of level ideas following CCLP4's level submission testing and voting process as well as the failure of a set that was being worked on, Josh decided to extend JoshL6 by creating 59 additional brand new levels and ultimately make the set have a total of 149. The 90 level version of this set still exists online though will never be updated. On November 1st, 2015, Josh released a special CCLP4 submission levelset, containing a vast 273 levels; all of which have been seen in previously existing levelsets. It was later updated to hold 320 levels, the most submissions from any one designer. As of now, this set was updated again, with the removal of the ones that made it into CCLP4 and replaced them with new ones added into JoshL6. In addition, levels from his newest CC1 set - JoshL7, were added, making the grand total to 350 levels. Following completion of CC2, Josh decided to work on his first levelset of that game, calling it "Flareon1", to show no connection with his JoshL sets and instead going under his alias name. As of June 23rd, 2016, it holds 55 levels, however, there are some levels in development. He has since taken a hiatus from CC2 level design, however, will return to designing someday. 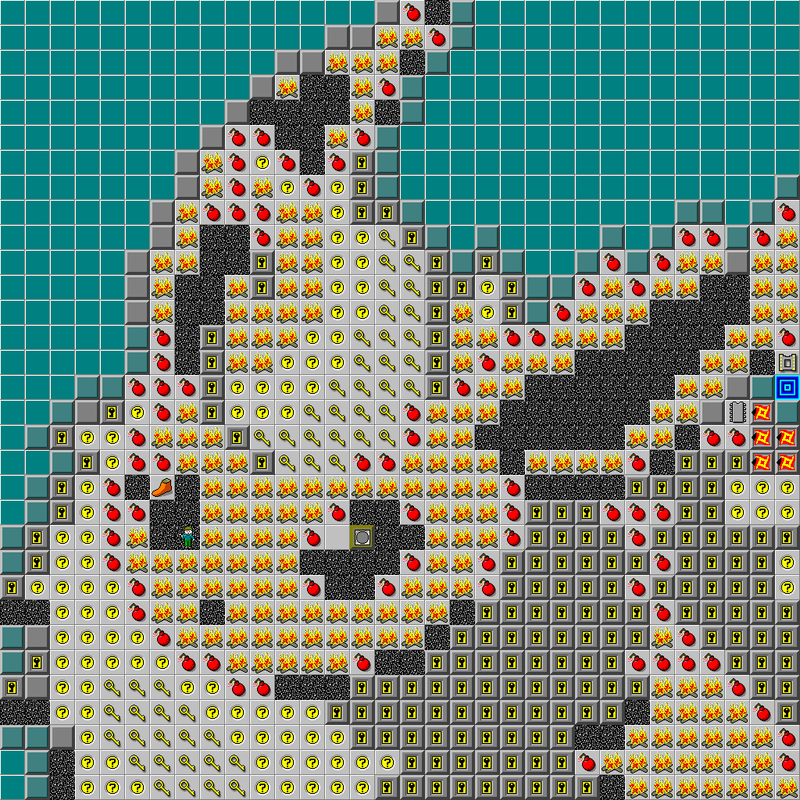 Flareon1 has since been taken offline as a means to overhaul it before releasing it again. During the year of 2017, Josh worked on JoshL7 a new CC1 set entry in the JoshL series which holds 70 brand new levels and was released on February 20th, 2018. These levels were made after playing through CCLP4 and other new custom sets. Following this in the months of March to November 2018, Josh worked on Walls of CCLP3, a set with entirely new levels built out of the wall patterns or other prominent tiles of CCLP3, which was ultimately inspired by Jeffrey Bardon's Walls of CCLP4. After releasing Walls of CCLP3, Josh has hinted at continuing with CC1 design as it is his preferred area to design in and has stated he has several projects in mind to work on. Josh's early levels seen in JoshL/JoshL1 were admittedly ripoffs for the most part and were very lackluster. While he states he is embarrassed of his levels showcased in those sets, he is not ashamed of it, as it was just a step in his career of level design. While constructing JoshL2, despite showing improvements and actual originally in that set, there are still some lackluster levels. This is because he had no real goal with the set, other than to be Lynx-compatible. Josh considers JoshL3 to be a mistake, due to the major updates with level amount and inconsistencies it holds. He originally wanted to focus on more difficult levels but because of the vast amount of updates it has had in the past, he feels he failed to meet this goal. He states that JoshL3 is suppose to be "that lame sequel", though it does hold a few gem levels, including some that made it into CCLP1! Josh didn't get his real inspiration until JoshL4, where he showed a real consistency in level design. He decided to avoid using North and West thin walls as much as possible. This is because of their appearance under the MS tileset as he playtests and casually plays in the MS ruleset, more so than in Lynx. He also decided to focus more on level difficulty in JoshL4, since he failed to do so with JoshL3. This ultimately makes this set fall under some of the traps CCLP3 had unfortunately. Because this set was let's played by J.B. Lewis, he received feedback on majority of the levels, as well as the set itself. While the feedback was positive, it made him realize his strive to make more friendly levels, which lead to JoshL5. The goal of this set was to show originality, as well as some interesting concepts and have fun to play levels that aren't nearly as hard as the ones from the previous set. It was once again let's played by J.B. Lewis, receiving great feedback. JoshL6 started out as more of a test to see if Josh had more ideas or not. He decided to work on a set that focused more on aesthetics - something that JoshL5 had but didn't entirely focus on. This set also took a different take in design, showcasing monsters on top of various different tiles, something Josh has always admired. This set features levels containing more mazes and even more unseen concepts. It also has very little amounts of sokoban puzzles - admittedly something JoshL5 had too much of. JoshL6 is also notable to using wall patterns from other levels, particularly from CCLP1 levels. This is due to a project attempt that never saw the light of day and because he didn't want to reject the levels built for said project, he placed them into JoshL6 in a later update. In his CC2 set "Flareon1", Josh has still yet to find his taste in design, as there are many new elements to be familiar with. He is also trying to avoid the mistakes he made with his first CC1 sets. It is currently in construction and has 55 levels, however, he plans on rearranging the levels, as well as rejecting some in its final release someday. 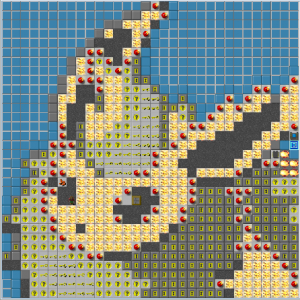 Between Flareon1 and JoshL7, Josh attempted a project titled Walls of CCLP1, a set that would have had new levels built within the wall configurations of CCLP1. This choice was inspired by Joshua Bone's CC2 set Walls of CC1. Unfortunately, this set was abandoned about 20 levels in most for reasons such as lack of ideas and the motivation to do such a project just wasn't had at the time. The levels that were made here were later placed in JoshL6. Following this failed project, Josh made some levels for a CCZone create competition, as well as a few other levels, which unintentionally started JoshL7. It was decided to pursue with the project and continue to build for it, despite the interest in CC2 designing at the time. With this set, Josh focused less on aesthetics and more on the levels themselves, making them more involved or showcase a concept that was underrepresented. Like JoshL4 and 5 before it, this set was once again LPed by J.B. Lewis, in which it was praised for showing originality and being very fun. Walls of CCLP3, in some spirits, can be portrayed as JoshL7 part 2, since it's construction started only a month after JoshL7 was complete. However, this set was more a test to see if it could be done, as it was attempted with CCLP1 before. This set of levels features further level concepts as well as experiments with tile combinations, particularly with blobs and other normal moving monsters. This set also features original sokobans and block puzzles, albeit some are inspired by other levels. This and JoshL7 are Josh's personal favorite sets, along with the new JoshL6. This particular level was created at the end of the JoshL3 era, and thus has become a signature level to Josh as it is his favorite Pokémon. Flareon, is the only level to be recurring throughout Josh's levelsets. It is usually the last level of every JoshL set, however, there is an exception, mainly to JCCLP. JoshL, JCCLP2, and Walls of CCLP3 are the only sets to not have this level; it doesn't fit into the context of Walls of CCLP3 and JoshL, and JCCLP2 is meant to focus on the levels themselves. This level was also reformatted in JoshL4, having more gameplay involved than the one's in JoshL1, 2 ,3 and JCCLP. It was again remastered for JoshL6, removing a few busts and adding more chips compared to JoshL4/5's version, however, there are still extra items. For JoshL7, this level was once again updated to remove all extra content. The blue wall mazes were also changed to make it less trivial compared to previous versions. Its time limit was also increased to 350 to match with Josh's CC username. On August 28th, 2011, Josh started his first CC let's play, being CCLP2 due to its unpopularity and for the sole fact he has never played the set, but watched many of the AVI solutions for a great number the levels, making this series semi-blind. After finally finishing the set, Josh expanded his Let's Play style by putting more effort into the editing process of his videos, as well creating Let's Plays for a larger number of custom levelsets, in addition to acquiring a registered version of HyperCam 3. His final score for CCLP2 after completion was 5,941,970. Custom sets he has successfully let's played include BHLS1 and BigOto Returns. He attempted to let's play Rock-Beta, TS0, and CCLP3, however, it all ended midway due to the computer being used dying out on him because of a fault in the battery. While the one of TS0 was just underway, the let's plays of Rock-Beta and CCLP3 were nearly completed - being at level 38/50 of Rock-Beta and at level 130 of CCLP3. He later came back and began let's plays on another custom set titled "lookatthis.dat" as well as CCLP1 in Lynx. Ultimately, Josh lost interest in playing lookatthis.dat due to its incredibly difficult levels toward the end of that set. His CCLP1 LP abruptly ended 137 levels in due to recording errors, as well as a loss of interest in let's playing in general. Despite this, Josh came back to finish his CCLP1 Lynx LP over a year later and successfully completed it, making him the second to LP CCLP1 in the lynx ruleset, however, the first one commentated. His final score was 5,945,920 and does not plan on improving it. Shortly after completing the CCLP1 Lynx let's play, Josh started LPing Ultimate Chip 5 by Jeffrey Bardon. This LP went on a steady pace and finished at 36 episodes total. Alongside this let's play was Chip's Challenge 2 custom set "TSAlpha" by Tyler Sontag. This is the first custom CC2 set to be let's played by any one person. However, due to this set's construction it is not a complete LP at the moment. After Ultimate Chip 5, Josh went on to LP a set known as "Not_CCLP4", an April Fool's joke created by the CCLP4 staff claiming to be CCLP4. This set contains some of the most frustrating, obnoxious levels created by the members of the CCLP4 staff over the course of their perspective level designing careers, ultimately making this set intentionally bad. Despite this it was still LP'ed and was close to fully completed, with 146 out of the 149 levels solved. The 3 unsolved ones consisted of levels that would have taken too long to solve and were not LP friendly at all, though Josh theoretically solved one tough level due to being two spaces away from the exit. Since then, Josh has gone through CCLP3 once again, this time in the Lynx ruleset, in hopes to have an actual completed run of that set in LP format. He has hidden his older run through the set permanently. As of 12/1/2018, He has been playing through ZK-Adventure - a 350-levelset created by Zane Kuecks specifically for Josh to LP that combines Zane's levels from his ZK sets. He is also playing through Walls of CCLP4. He also still plans on finishing TSAlpha, since its construction is finally completed. In the future, he plans to Let's Play sets such as Walls of CCLP1 by J.B. Lewis, and possibly other CC2 sets. While Josh doesn't particularly optimize, he does hold a few records. He scored the official bold times for Generic Ice Level and Rhombus, as well as confirming the bold for Blockade in CCLP1 under the MS ruleset. He has also confirmed several MS bolds in CCLP4. Despite not being much of an optimizer, his scores are relatively good, placing him in the top 10 on the overall scoreboards at 10th place. He is also in 5th place on the scoreboards for CC2. Josh took the role of co-leader of the staff of CCLP4 on October 31st, 2015 alongside Jeffrey Bardon. In total, Josh has created nearly 1,300 levels. Josh has submitted the most amount of levels for CCLP4 consideration than any other community member. In his recent levelsets, he usually names his levels after specific locations in other video games of his liking or they are generated off a website. Most of his inspiration in level design is from the music he listens to, which is normally OSTs from video games, such as ones from various Pokémon titles. This page was last edited on 12 March 2019, at 20:19.